Find the insect repellent that is right for you. Arboviral diseases caused by arboviruses (short for arthropod-borne viruses) are spread to people through the bites of infected mosquitoes, ticks, sand flies, and other arthropods. More than 150 arboviruses are known to cause human disease. On the mainland of the United States, mosquitoes can spread West Nile virus (WNV), Western equine encephalitis (WEE) virus, Eastern equine encephalitis (EEE) virus, St. Louis encephalitis (SLE) virus, California serogroup viruses (California, La Crosse, and Jamestown Canyon encephalitis), among many other. The transmission risk and distribution of these diseases vary significantly based on mosquito population levels, the distribution and abundance of the diseases’ animal reservoirs, and seasonal weather patterns. Powassan virus is a tick-borne virus that is established in many northern states of the U.S. Travel-related arboviruses include dengue, chikungunya, Japanese encephalitis, tick-borne encephalitis, Venezuelan equine encephalitis, yellow fever, and Zika viruses. Some of these arboviruses, such as dengue virus, can also be transmitted in the U.S. territories of Puerto Rico, the U.S. Virgin Islands, American Samoa, the Northern Marianas, and Guam. The symptoms of an arboviral infection can range from very mild to very severe. Most people who are infected do not show any symptoms or only experience mild fever, headache, body ache, nausea, vomiting, or rash. Severe cases are rare and can be characterized by high fever, stiff neck, disorientation, tremors, altered mental status, inflammation of the brain, paralysis, coma, or even death. Arbovirus infections are typically transmitted via the bite of an infected mosquito, tick, sand fly, and other arthropods. Other modes of transmission are possible but not as common. These include transmission through the transfusion of infected blood or transplantation of infected organs or tissues, occupational exposure in healthcare settings, and via mother-to-child during pregnancy or breast feeding. In the case of Zika virus, sexual contact may also be a mode of transmission. Diagnosis of arboviral diseases are based on a combination of clinical signs and symptoms, recent travel history, possible exposures, and laboratory testing of the blood, serum, cerebrospinal fluid, tissue, other body fluids. There are no specific treatments for arboviral diseases. People with mild illness usually recover within a week with no complications. Treatment is limited to supportive care, such as bed rest and acetaminophen (Tylenol) to treat fever and pain. Patients are also advised to drink fluids to prevent dehydration. Aspirin and non-steroidal anti-inflammatory drugs (like ibuprofen) are not recommended as they can increase the risk of bleeding during the infection. If patients are taking medicine for another medical condition, talk to a healthcare provider before taking additional medication. Healthcare providers can provide supportive therapy to patients with severe infections. After someone has been infected with a specific arbovirus, they are likely to be protected from that virus in the future. Most arboviral diseases are not an immediate threat to Hawaii due to the lack of insects and arthropods that transmit the diseases. However, Hawaii does have species of Aedes mosquitoes that are capable of transmitting diseases such as dengue, chikungunya, and Zika virus. Aedes albopictus is widely spread throughout the state, and Aedes aegypti has been identified at sites on Hawaii Island. Hawaii’s tropical climate creates a year-round mosquito season. Therefore, after returning from their travels, it is important that infected individuals protect themselves from further mosquito bites during the first two weeks of illness to prevent local transmission of the disease. 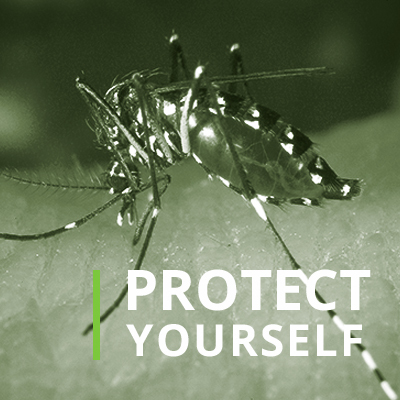 The Department of Health has enhanced the surveillance and prevention efforts against arboviral diseases and has increased mosquito control efforts for the state of Hawaii. Residents should take basic precautions to protect themselves from mosquitoes by following the Department of Health recommendations. It is important for individuals preparing for travel to be aware of exotic arboviral diseases, what is being transmitted within their travel destinations, and how they can protect themselves while traveling. Apply Environmental Protection Agency (EPA) approved repellents as recommended by product label. Wear long pants and long sleeved shirts when outdoors. Maintain screens on windows and doors. Empty or drain water at least weekly from garbage cans, house gutters, buckets, pool and boat covers, coolers, toys, flower pots, or any other containers. Remove/destroy discarded tires, bottles, cans, pots and pans, and broken appliances, or anything that holds water. Select arboviral infections can be prevented through screening of donated blood and immunization. The blood supply in the United States has been screened for West Nile virus since 2003. Vaccines are available in the United States to protect against travel-related yellow fever and Japanese encephalitis. Arboviral diseases are notifiable in Hawaii and should be reported by telephone to the Disease Outbreak Control Division, Disease Investigation Branch on Oahu, or to the District Health Office on the neighbor islands as soon as a provisional diagnosis is established. For select arboviruses, including dengue, chikungunya, and Zika, patients may remain viremic during their acute illness, which poses a higher risk for further transmission, increasing the importance of timely reporting. Arboviral diseases due to Dengue, Zika, Chikungunya, or Yellow fever viruses are nationally notifiable to CDC using specific case definitions. Many other exotic arboviruses, including Japanese encephalitis, Tick-borne encephalitis, Venezuelan equine encephalitis and Rift Valley fever viruses, are important public health risks for the United States. Healthcare providers should maintain a high index of clinical suspicion for cases of potentially exotic or unusual arboviral etiology, particularly in international travelers. The State Laboratory Division (SLD) of the Hawaii State Department of Health (HDOH) can perform several different tests for Chikungunya, Dengue, St. Louis encephalitis, West Nile and Zika viruses. All specimens should be routed to SLD through a certified clinical laboratory. All specimens submitted for testing at CDC must be routed to CDC through SLD and take at least 3 weeks after specimen receipt. Healthcare providers submit the specimens to SLD along with the completed Clinical Specimen Submission Form (SLD Form 81.3). All testing requires HDOH review and approval. If healthcare providers pursue testing through a private commercial lab, consult clinical laboratory for send-out options. Healthcare providers should follow CDC testing criteria for whom to test and guidance for what should be tested.